THE GREEN, LINDEN CLOSE, STARTING AT 8:00PM, AND WILL LAST ABOUT 90 MINUTES. WRAP UP WARM, BRING SOMETHING TO SIT ON AND PERHAPS SOME POPCORN AND A DRINK. 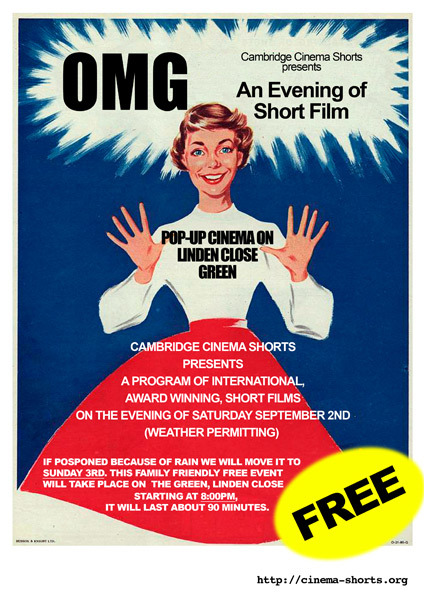 CAMBRIDGE CINEMA SHORTS IS A LOCAL, VOLUNTEER RUN ORGANISATION DEDICATED TO THE PROMOTION, SCREENING, EDUCATION AND PRODUCTION OF SHORT FILMS. Short films: What are they? Short films, average length seven minutes, are made for many reasons, low to no budget personal works by established film makers, film student projects, calling cards within the film industry and cover all genres – drama, documentaries, animation, music and experimental. Short films, because of their time and budget restraints, are often honed to the essence of film making, pared down to produce exquisite jewels of the craft, cut and polished until a couple of minutes of low budget film can have more impact on the viewer and stay with you far longer than two and a half hours of Hollywood blockbuster ever did. Short Films are an art form in their own right and we passionately believe that they should be seen and enjoyed for by as wide an audience as we can possibly muster. They come in bite sized chunks and are easily digestible. So, please come to our show. We promise you will not be disappointed and it could be the start of a passion that will brighten your life.